Tracy Letts' "August Osage County." 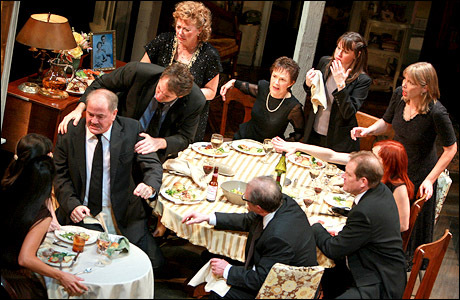 Tracy Letts' "August Osage County" on Broadway. The film version, starring Meryl Streep, premieres November 8. Friends may outright tell you that acting is a terrible career choice, or barely conceal their judgment behind a condescending smirk. However, what these people may not realize is that actors are skilled professionals (no matter how much or how little they get paid) and that acting is more than just strutting around a stage and looking pretty for a camera. If forced to deliver a monologue before an audience of thousands, they might have a better appreciation for what actors do every 18-hour day on a film set or eight shows a week on Broadway. Acting is hard work. Those who pursue acting as a career often work full-time jobs during the day, then hurry off to auditions on their lunch breaks and to the theater for rehearsals and shows at night. They eat, sleep and breathe their craft, sacrificing other more lucrative job offers in favor of their first love. Actors are a passionate bunch, and many have the jaw-dropping talent to merit star status alongside professional musicians, authors and athletes—even if they never acheive it. Yes, some actors are hired for plum roles on film and television solely because of their looks or family connections (see Sofia Coppola in The Godfather Part III and Megan Fox in everything). However, other rising A-listers who are not conventionally attractive (like Steve Buscemi on Boardwalk Empire, the great Tilda Swinton and Chicago&apos;s own Michael Shannon) succeed because they are astoundingly good at what they do. The act of "acting" is harder than it looks. Although pretending to fall in love with Johnny Depp might not look like the hardest job in the world, imagine the real-life scenario. Under the pressure of hot lights, multiple camera angles and several dozen crew members watching with bated breath, just remembering lines (not to mention delivering them well and performing convincingly) is a rare and truly impressive skill. Many of the best film actors working today (Meryl Streep, Edward Norton, Al Pacino, etc.) first honed their skills in the theater. Myriads more have studied under the rigorous acting tenets of Uta Hagen and Lee Strasberg, devoting themselves completely to an art that few people can master, and even fewer actually acknowledge or respect as a viable career. Good acting deserves to be seen and celebrated. Go to the Goodman, Steppenwolf, Victory Gardens or practically any other small storefront theater in Chicago to see the sublime acting talent that our city has to offer. For a better understanding of film actors and the intense work that goes into their craft, watch Inside the Actors Studio with James Lipton (recommended episodes: Jack Lemmon, Paul Newman and Kate Winslet). Not everyone has what it takes to be a great actor; but to study acting as a true art form is a noble pursuit, and certainly worthy of respect. In the words of legendary acting coach Stella Adler, "Life beats down and crushes the soul, and art reminds you that you have one."